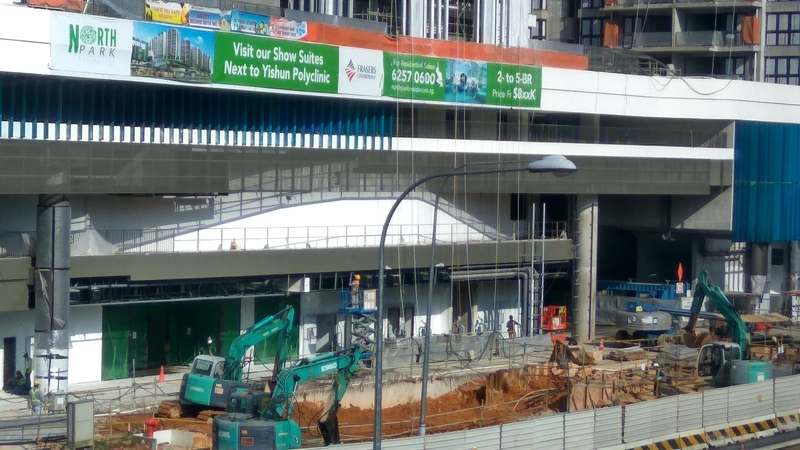 In the past, there were similar projects where the condo blocks/stacks/units are directly built above a bus terminal/depot. 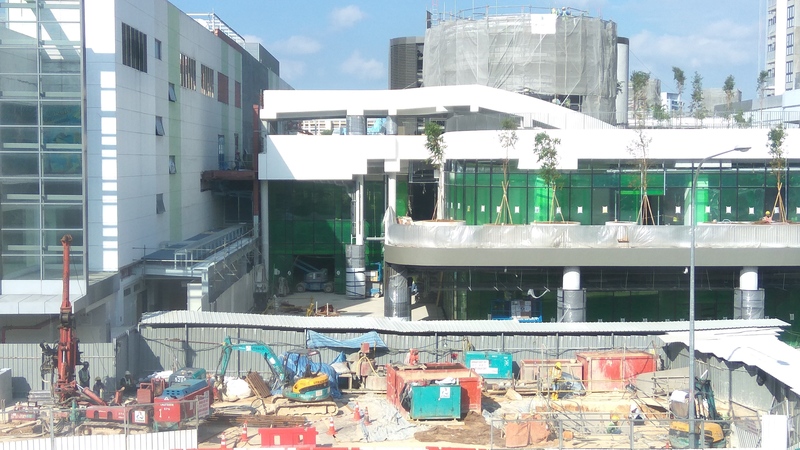 For example, five years ago, The Centris @ Jurong Central TOP in 2009. Then, soon after, I received several requests for some of the units in stacks #47, #50 and #51 for Feng Shui investigation(s) as several of the family members that moved-in had some accident or so after moving in. So happen; that year 2009: the Bad Yellow star #5 (misfortune/sickness) is at the frontage directly above the Entrance/Exit of the bus terminal/depot. 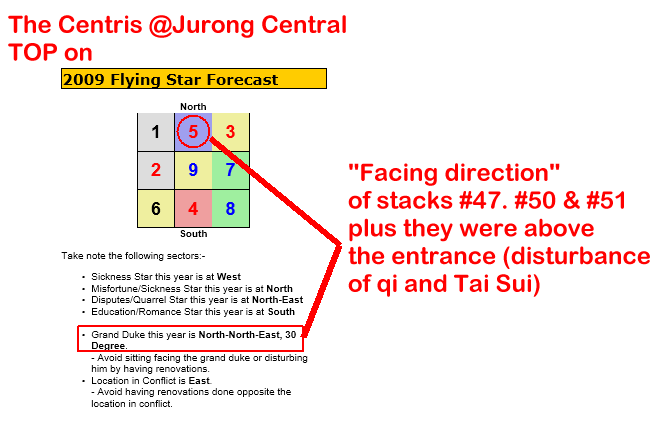 And also "Grand Duke-Tai Sui" was located at North-North-East 30 degrees... adding a double whammy. 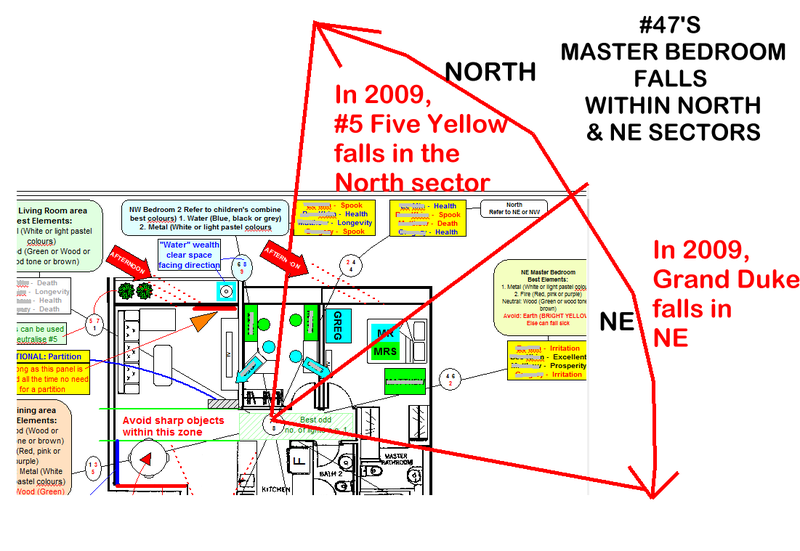 Here, especially for stacks #47 and #51; their master bedroom falls within North & NE sectors. 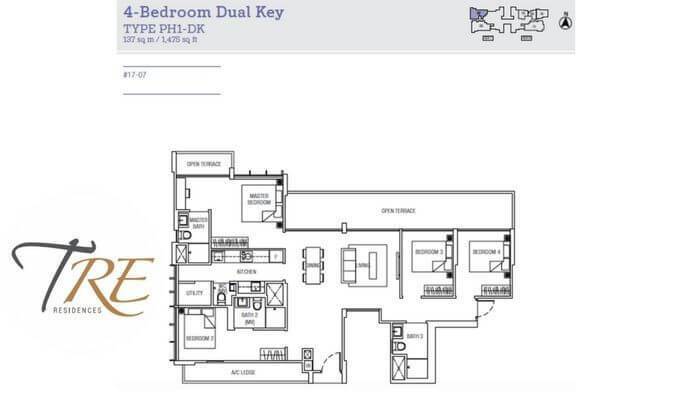 And for that year North = #5 Five yellow and NE = Grand Duke (Tai Sui)... and the constant movement of buses in and out directly below the master bedrooms is inauspicious. 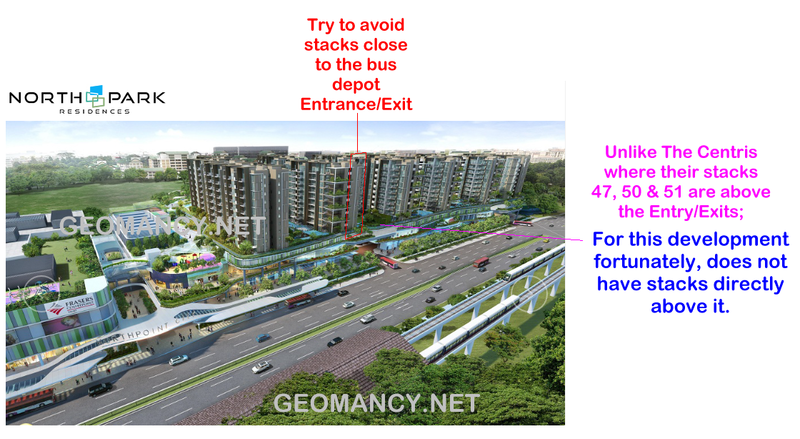 have stacks directlyabove the entrance/exit to the bus terminal/depot. 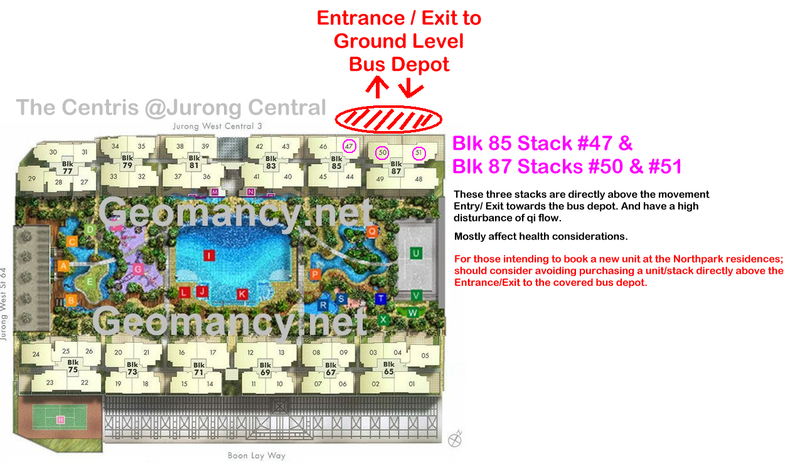 But if possible try to avoid purchasing stacks close-to (above) the entrance/exit as shown in the attachment. However, there are another exit in the 2nd attachment. Do study where each of the Entry/Exits are in this development and if possible, avoid "them". 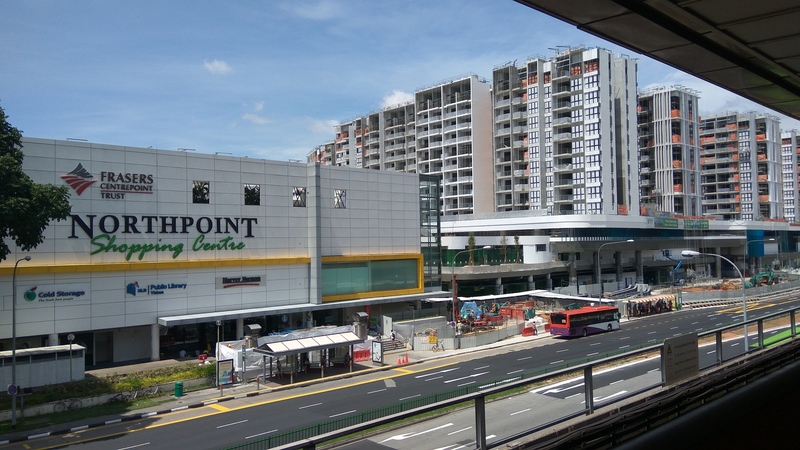 Jurong Central TOP in 2009. 1. This development has majority of stacks facing either N2 or S2. 1.1 Under Flying stars; there is a difference between a N2 facing vs a S2 facing chart. 1.2 Here, under N2 facing; the combined auspicious wealth stars are wasted at the rear of the home. Here, "rear" often means wasted at the kitchen / yard area in stead of at the frontage like that of an S2 chart. 1.3 S2. Stacks are the best stacks for a East group person. As both frontage enjoys the double auspicious #8 wealth stars. And furthermore their facing directions has water. Bring great wealth. 2. Blocks/ Stacks as shown in purple in the attachment e.g. Block 25, 27, 29, 31, 33, 35, 37 have stacks that either face NE1 or SW1. 2.1 NE1. Has the auspicious water wealth #8 star at the frontage. 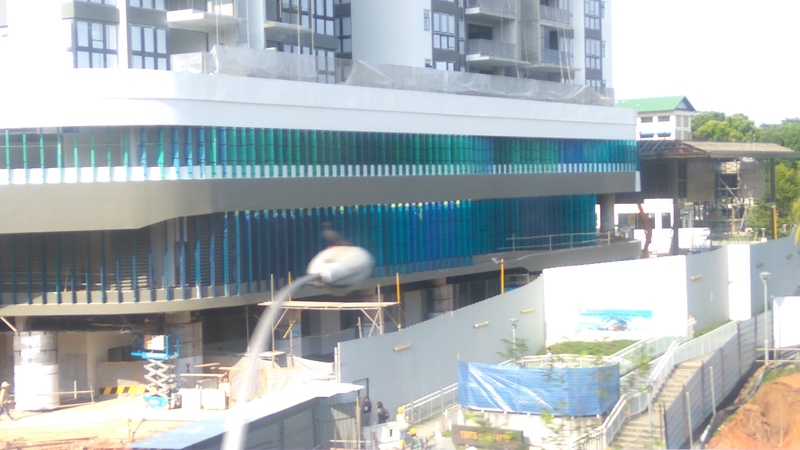 Thus, units with water position at the frontage (balcony side) can enjoy good Feng Shui. If so, the sum-of-ten can be activated for : Health, wealth and family luck. If the unit is not facing a water position, then best to place a water position at the balcony area to activate the luck. On the downside; the other sectors in such a home has bad stars that best to be disarmed or neutralised. 2.2 SW1. As the water wealth #8 is at the frontage; water at the frontage is good. It will be advantages if the unit faces a pool of water or activate a water position at the balcony area. As such overall, the unit can activate the sum-of-ten. Need though to disarm bad stars in many sectors of the home. To disarm health related considerations. Wheres the Tai Sui position this year? Cos I should not do major reno in that area right? Thanks! I passed by there just a few days ago! Surprised by the fast progress; given that this is a large project. Appreciate your time and effort with sharing this with all of us! 1. 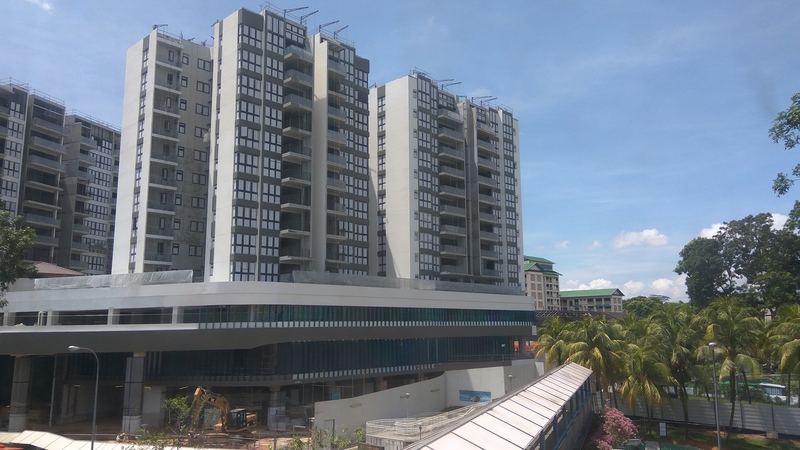 Sims Urban Oasis (1000+ units, launched in 2015, est TOP 2018) vs TRE Residences (200+ units, launched in 2014, est TOP 2019). 1. Economy of Scale: Big and Small projects both require similar administration overheads, hence large project has lower overhead costs per unit. 2. The need to recoup large investments more quickly. 3. Reputation also more at stake for big projects which are more visible with more buyers involved. 4. 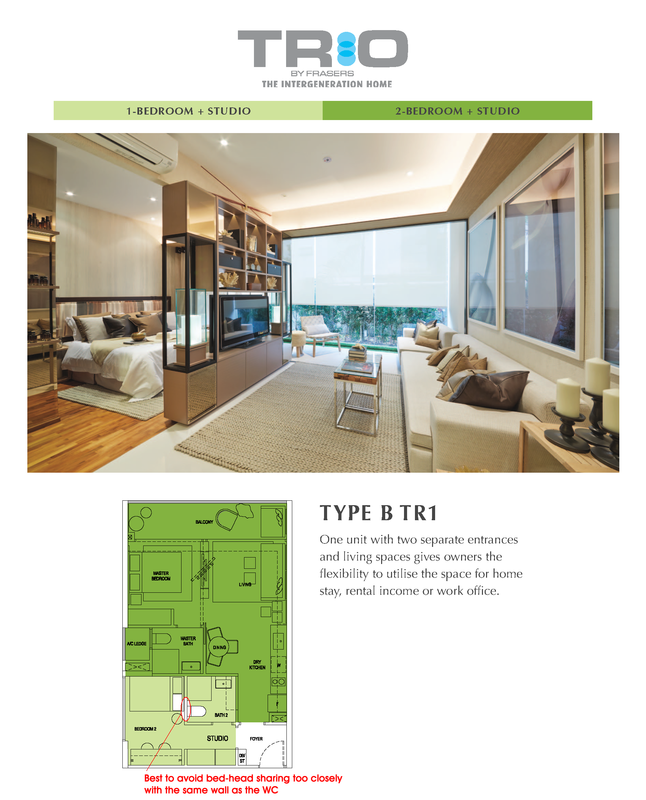 Last but not least, many units to sell means need to build units more quickly to attract buyers, else may face ABSD. 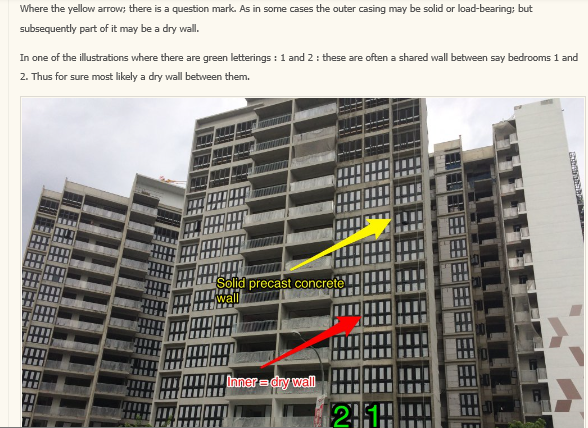 I am interested to find out whether TRE Residences internal walls are "solid concrete" or dry walls. I agree with your logic. As another factor is progress payments. In large projects, each time a certain landmark is reached, buyers must fork out an additional amount of money. Thus this can be a huge sum for a developer especially if they had taken loans. Plus they need the money to pay the main contractors. 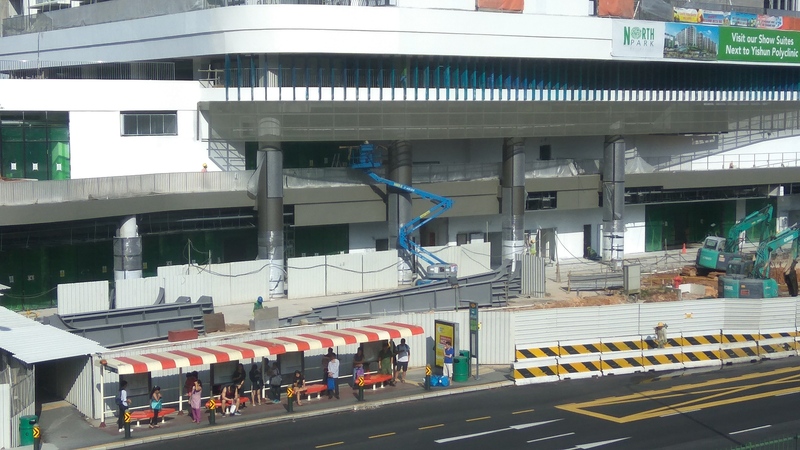 No pay.. no fast work.. A vicious cycle: Main contractor needs to be paid early.. etc.. etc..
For HDB BTOs, it is based on common sense. 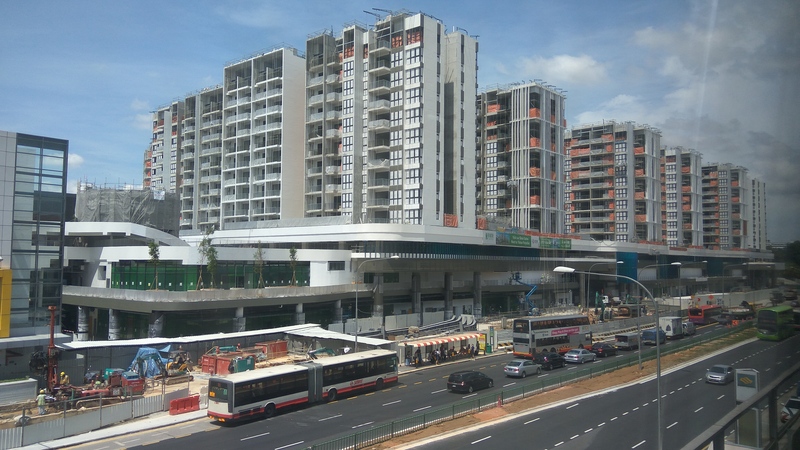 HDB Toa Payoh Crest because of it's height.. took close to 5 years to complete. Where usually a "standard" BTO development often T.O.P. 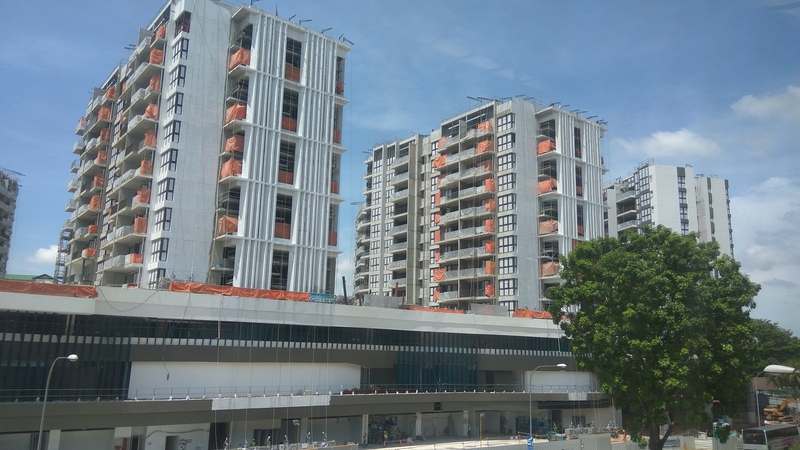 between 2 1/2 to 3 1/2 years depending on the size of the project. 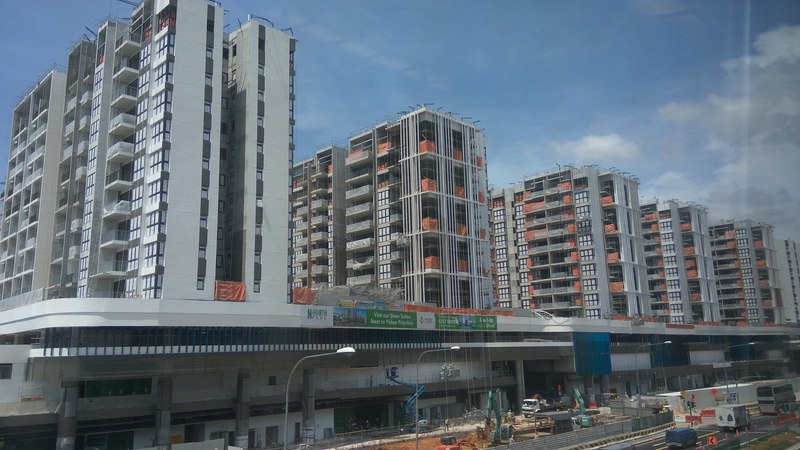 Majority of HDB BTO's are relatively between 500 units to 1200 max. I may drop by the Sims someday to take a look. But how to tell if it's solid wall or dry wall? By thickness? Or knock knock? One can observe whether it could be a solid or dry wall by taking an exterior look especially between two bedrooms: How thick is the separation "wall". Alternatively, some sales brochures are upfront and clearly state this. 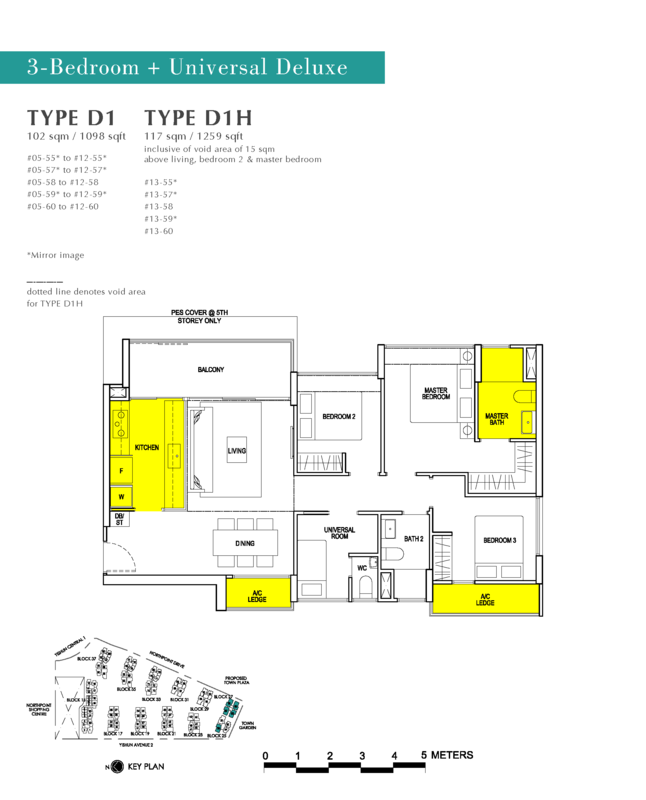 While other sales brochures generaly state that concrete/brick/dry partitions may be used. Here, sometimes dry partitions can be used at the toilet ceilings or kitchen ceilings. Thus none the wiser if the bedroom walls are solid or dry wall partitions. No mentioning of the development. However, in some instances, a few develoopments that I have been to e.g. 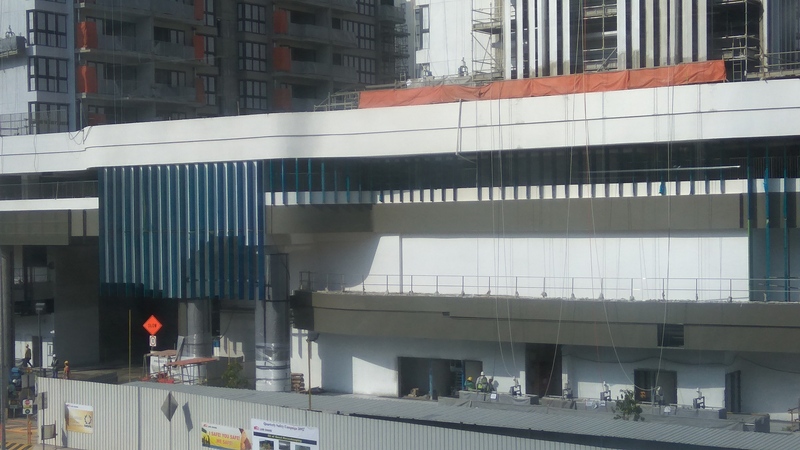 The Venue.. the structural architect added just a small portion of support beam, see below. 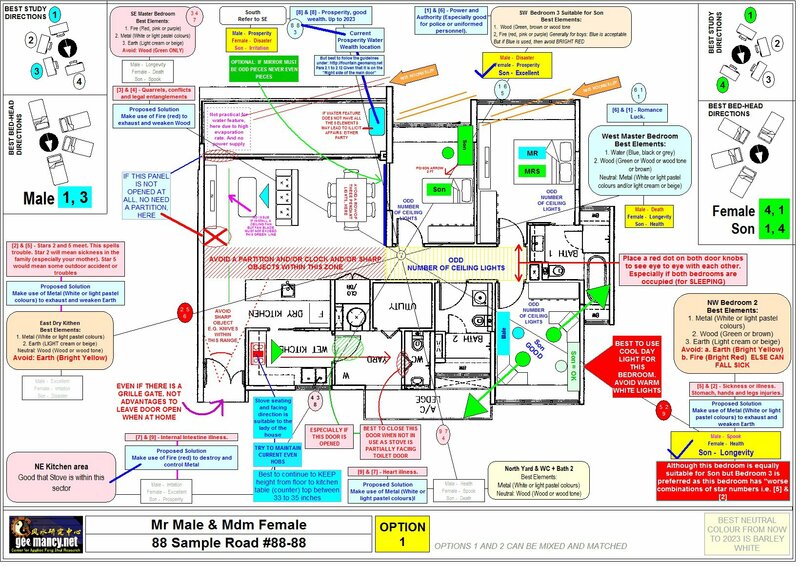 (Did one see the added YELLOW partial beam between bedrooms 3 and 4? In such a situation, it is hard to ascertain that the inner walls may be dry wall. As it looks uniform thickness. 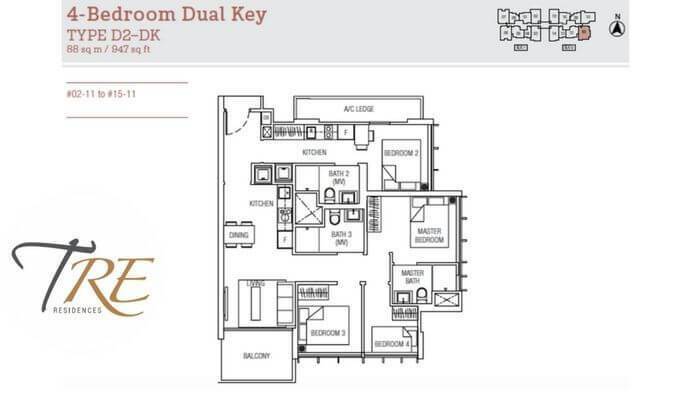 For HDB flats such as HDB Park Grove (this block is yet to T.O.P. I have been to it's Sister block. Thus know that inner walls are dry walls. But take a look at the exterior. Virtually can't tell if the interior uses dry wall partitions or not. 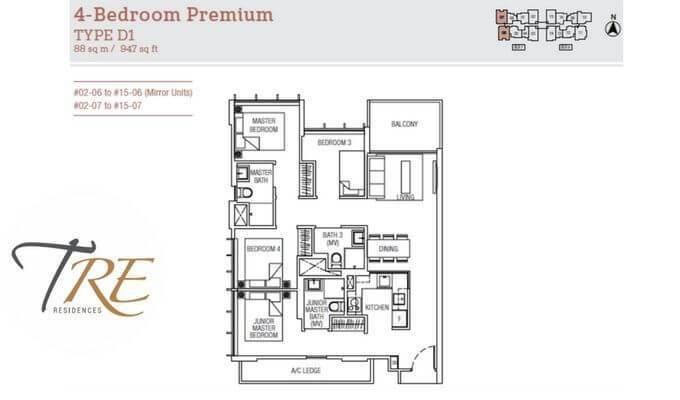 Even can't tell from the layout plans. Only know when one enters the unit and knock, knock on the walls. 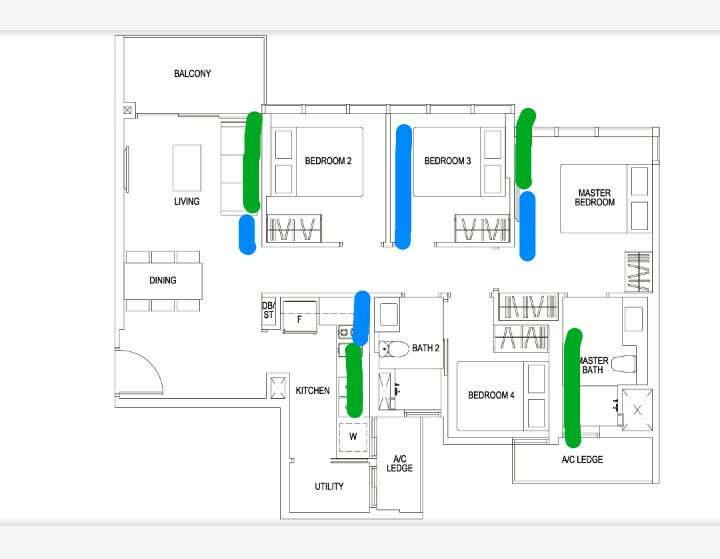 For this sample floor plan, judging from the wall thickness, maybe those marked in Green are Solid Walls, while those marked in Blue would be Dry Walls. Interesing that the same wall surfaces are actually made up of different materials. 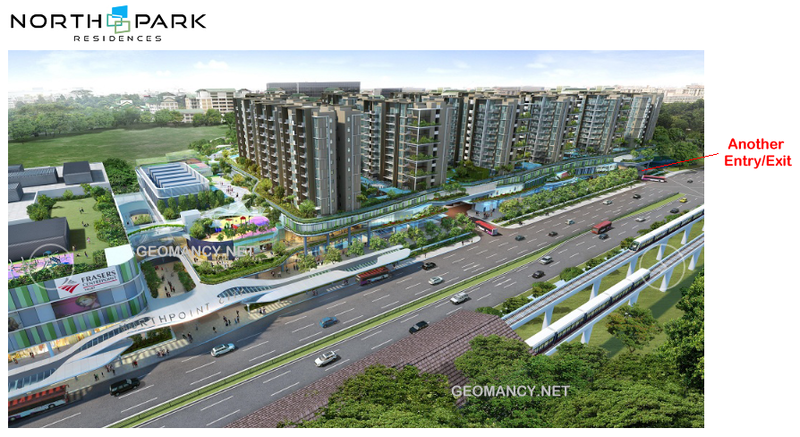 Other than the Livia at Pasir Ris where the toilets are some kind of moulded materials with some polycarbonate materials. In my opinion, so far, 99.99 percent of the time, all walls surrounding the toilets are solid. For practical reasons ... to avoid moulds or baterial to form and cause illness. 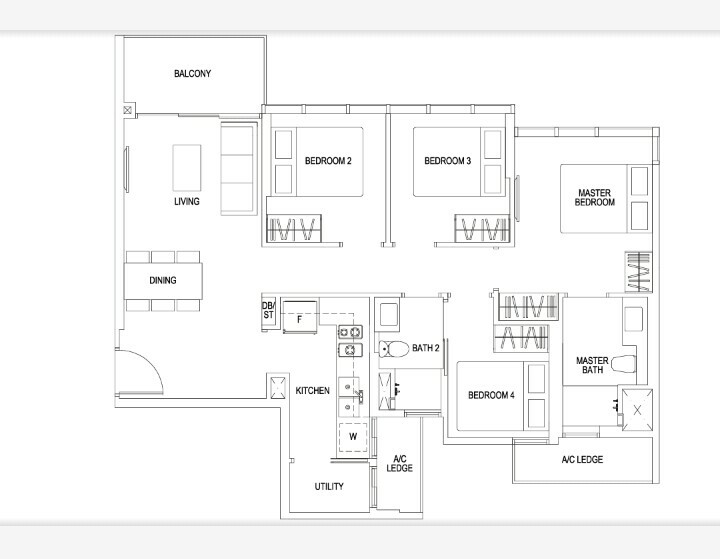 For the above Floor Plan, the wall between Bath 2 and Bedroom 4 seem to be Dry Wall though. That makes it the 0.01% then? In my opinion, the trend started with CDL. I discovered this when The Livia by CDL was launched a while back. And ever since, many other Developers also joined this ban wagon. We can also "blame" it on the countries that ban the sale of sand to Singapore. Starting from Malaysia.... However, these countries have their constraints especially political..
By the way, this layout has Fire Stove and WC side by side... Ops. By the way, this layout also considered as Stove and WC (Bath 2) side by side? 3. Master Toilet at the frontage of the unit. Special offer till 31 December 2018 = specifically for North Park Residence of a 20% off our audit fee! 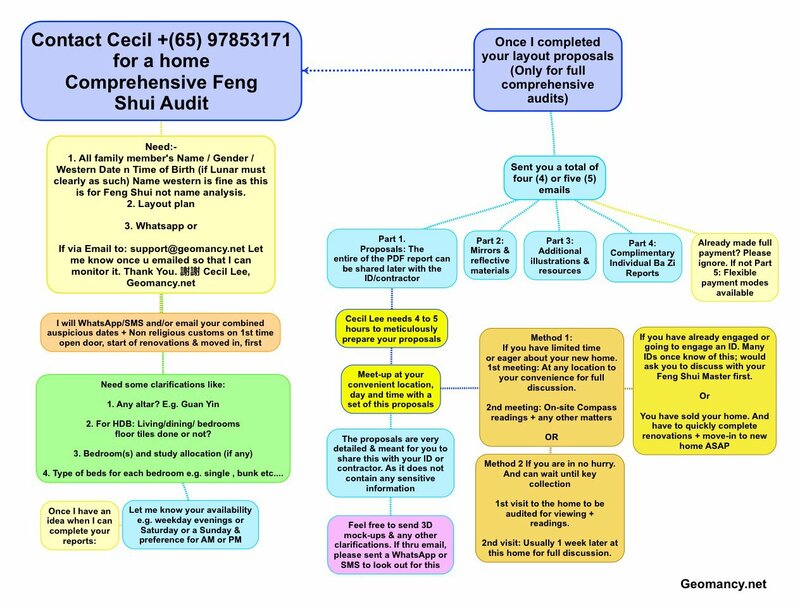 Get your Feng Shui Master to also discuss what will become the Feng Shui luck of your new home also from 2024 to 2043.